Laurie Thompson and her husband were leaving a Boston store while visiting family the night before Christmas Eve, 2014, when they spotted a solicitor for St. Jude Children’s Research Hospital. Next to the solicitor stood a sign with a poem written by a pediatric cancer patient. Unable to fathom being a parent of a child with cancer, the Thompsons eagerly made a donation. As they walked back to the car, they looked at each other, grateful for their two healthy children. “I started becoming hyper-aware of all the signs at schools and at parks that said, ‘Warning! Roundup Treated Area’ and realized that these pesticides are everywhere our kids are,” Thompson says. Meanwhile, Irvine resident Kathleen Hallal was also trying to stop the incessant spraying. 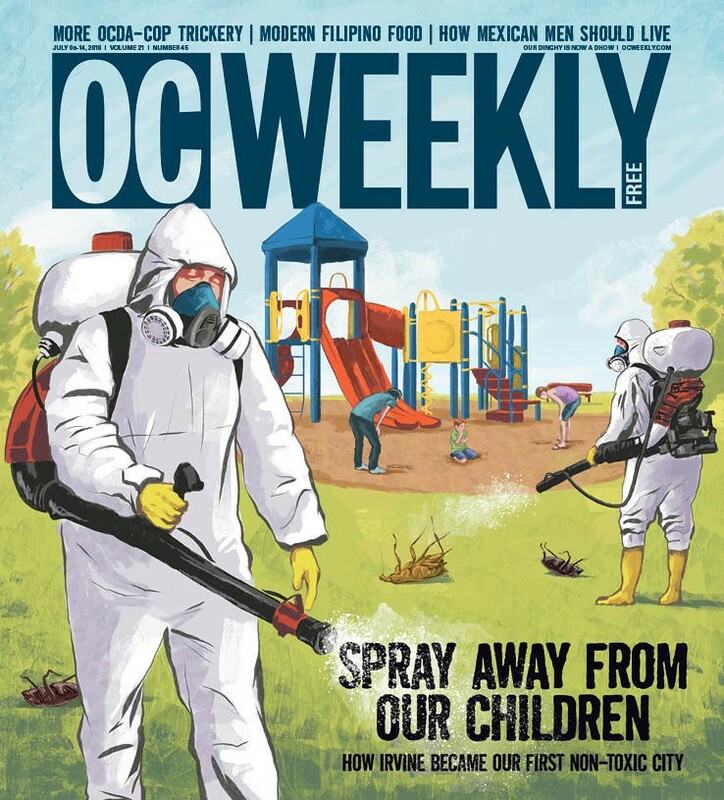 A member of her local parent-teacher school association, Hallal spent years pleading with the Irvine Unified School District (IUSD) to eliminate the use of pesticides at schools. Although her efforts were ignored, they gained her a reputation around the city. So when Thompson voiced her concern about the use of pesticides on the field used by her son’s soccer team, a friend suggested she reach out to Hallal. 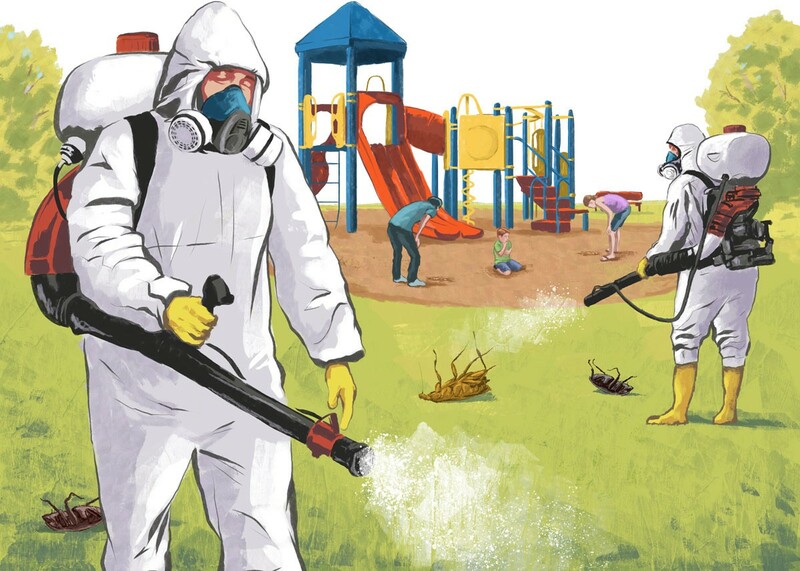 But she soon realized that Roundup and 2,4 D weren’t just being sprayed at schools: The pesticides were used on every city park and sports complex. (The Irvine Co. failed to respond to several email and phone messages for this article.) 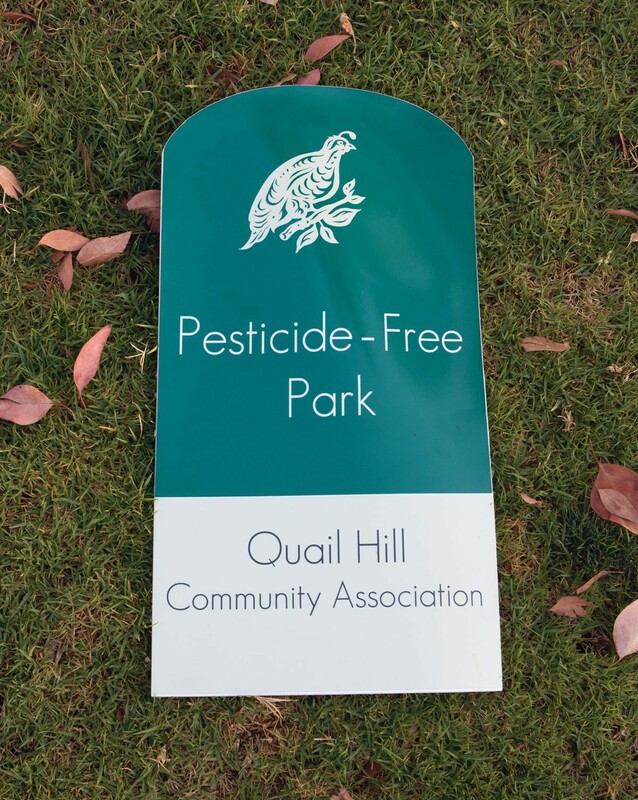 After talking to a friend about what could be done, Konte met Hallal, Thompson and Craciun, and they began devising a strategy to stop the use of pesticides in Irvine. As the quartet of women discovered, landscape-maintenance is a male-dominated industry. And the majority of city and school officials who end up making the final decisions are male. The moms knew they needed to add a male member to their group. 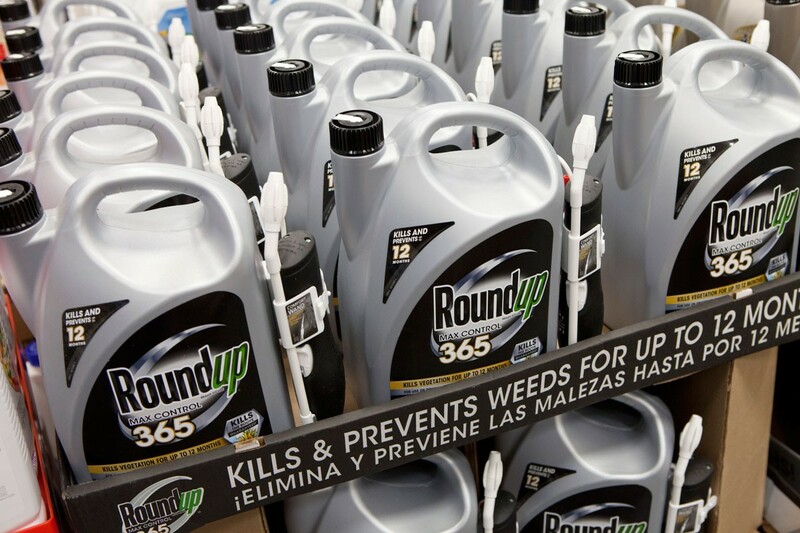 With that in mind, Hallal approached Bob Johnson, a Turtle Ridge resident, after a PTA meeting and asked if he might be interested in stopping the use of pesticides. Johnson admits that he didn’t know much about pesticides at that point. 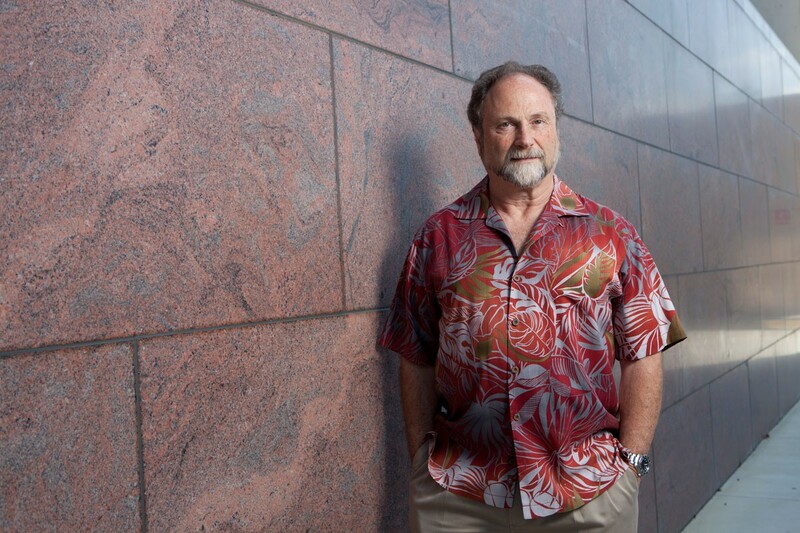 But Hallal’s outreach caught his interest because of a professor he knew at the University of Arizona. 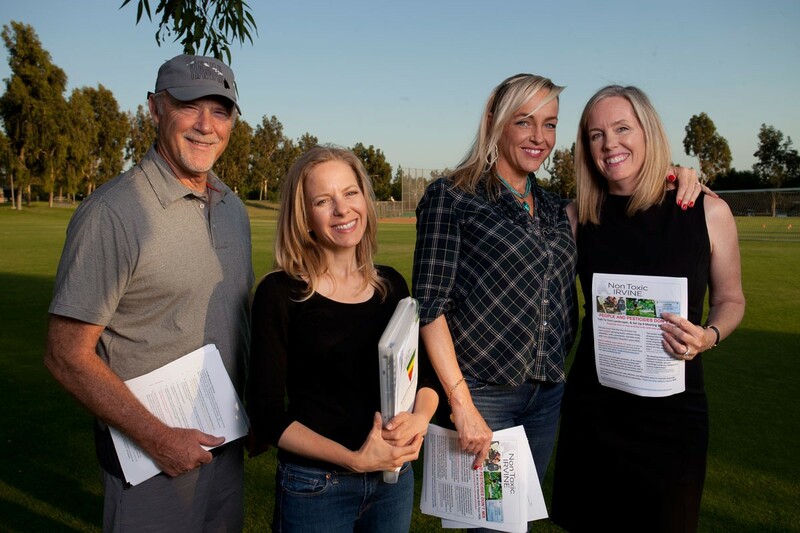 In early spring 2015, Konte, Hallal, Craciun and Thompson founded Non Toxic Irvine with the specific intent of making the city the first pesticide-free community in Orange County. But the group isn’t just a bunch of worried residents; the organization also boasts a team of scientific advisers that includes two UC Irvine professors, Dr. Bruce Blumberg (developmental and cell biology and pharmaceutical sciences) and Dr. Dean Baker (epidemiologist and director of the Center for Occupational and Environmental Health). The successful May 5 meeting with IUSD sealed the group’s first victory. But just because the IUSD wasn’t using Roundup or 2,4 D anymore didn’t mean they weren’t using other toxic pesticides. Furthermore, the city was still using Roundup and 2,4 D in public areas and near homes. All of this came to a head at an Irvine City Council meeting on Feb. 23, when Non Toxic Irvine demanded that the use of all toxic pesticides be eliminated citywide. Charlie was diagnosed with medulloblastoma, the same type of cancer Caelin had. Charlie’s mother, Laura Hilgeman, sat among the crowd and watched her son. “I asked if he wanted me to help him prepare what to say before the meeting, but he told me he had it covered,” Hilgeman says with a laugh. “We’re just so lucky that he’s still here. We are very, very good about enjoying each and every day because at any moment, things could change,” she adds with a quiver in her voice. The City Council voted 5-0 to eliminate the use of toxic pesticides, making Irvine not only the first city in Orange County to eliminate these chemicals from the landscaping plan, but also the first city in all of Southern California to adopt an organic, integrated pest-management program, which eliminates the use of synthetic pesticides, such as Roundup and 2,4 D, under all circumstances and incorporates manual removal, weed whacking and, if necessary, the use of organic pesticides as a means for weed abatement. 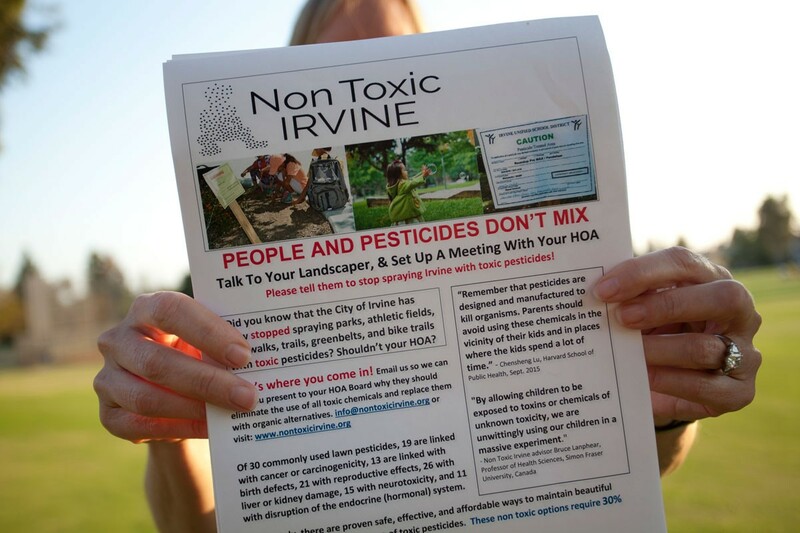 The members of Non Toxic Irvine see City Councilwoman Christina Shea as the main reason the ordinance was passed. Shea is a cancer survivor and a firm believer that chronic exposure to toxic chemicals in our environment can lead to serious health problems. According to Konte and Craciun, Non Toxic Irvine received nearly 100 messages within days of the meeting. People from San Clemente to Garden Grove to Smithfield, Road Island, to the United Kingdom reached out to Non Toxic Irvine to discuss how they could accomplish the same in their communities. A total of 26 Non Toxic teams have assembled as a result of the Irvine organization’s success. According to Craciun, the group has responded to the overwhelming requests for help by creating a playbook that lays out the necessary steps in order to create a non-toxic community. 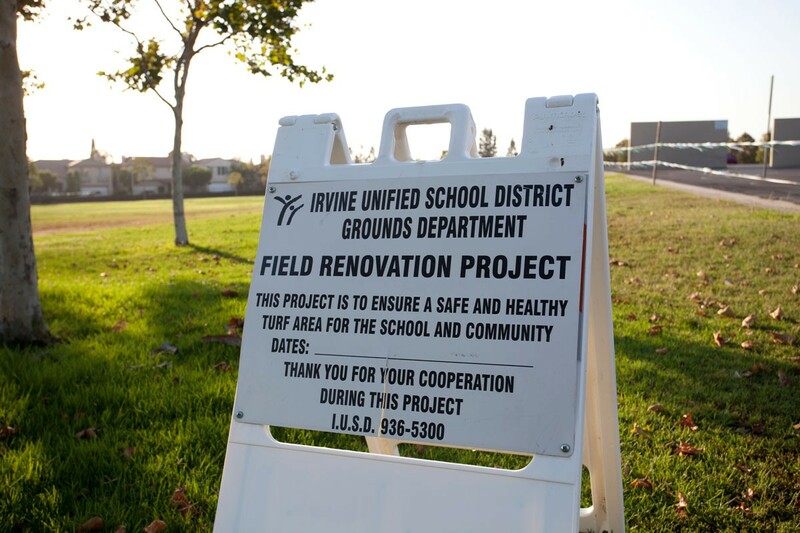 After IUSD decided to make the switch, Non Toxic Irvine set up an organic-landscaping training with Beyond Pesticides—a renowned nonprofit organization whose mission is to help transition away from using conventional landscaping methods by adopting organic, more eco-friendly landscaping practices. The sessions—hosted by Jay Feldman, the executive director of Beyond Pesticides, and horticulturist and turf-grass expert Chip Osborne—highlighted the financial, ecological and health benefits that come with eliminating toxic pesticides from landscaping routines. In 2014, when the doctor informed Thompson about the mass in Caelin’s brain, Thompson recalls looking at her ill daughter and watching her shake as tears filled her eyes. Thompson breathes deeply as she recounts her daughter’s battle with medulloblastoma. Caelin went into remission after a year of treatment and has been cancer-free for three years. Now a sassy 5-year-old about to enter the first grade, Caelin gives hope to children who have cancer and their parents. But, according to Thompson, the doctor appointments and MRIs are going to be a part of Caelin’s life forever.